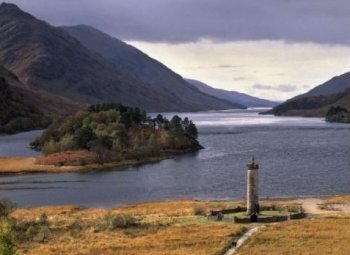 Loch Shiel and Glenfinnan Monument, Scotland. 40 Inch Canvas Print (101cm) by Robert Harding . through magnificent mountain scenery on either side. peninsula which terminates at the Point of the same name which is, in fact, the westernmost point of the Scottish mainland. the loch is called St. Finan’s Seat. faithful supporters on August 18th, 1745.